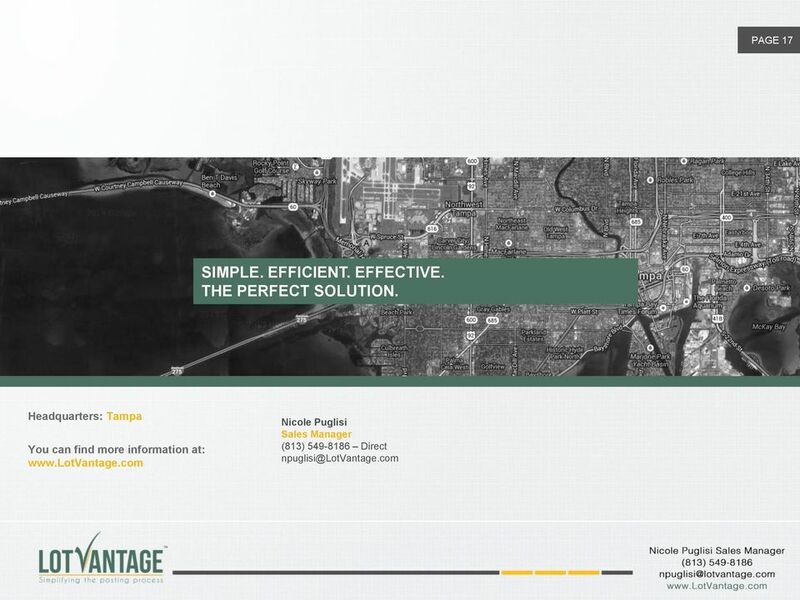 Download "Automotive LotVantage. Nicole Puglisi Sales Manager. Overview. 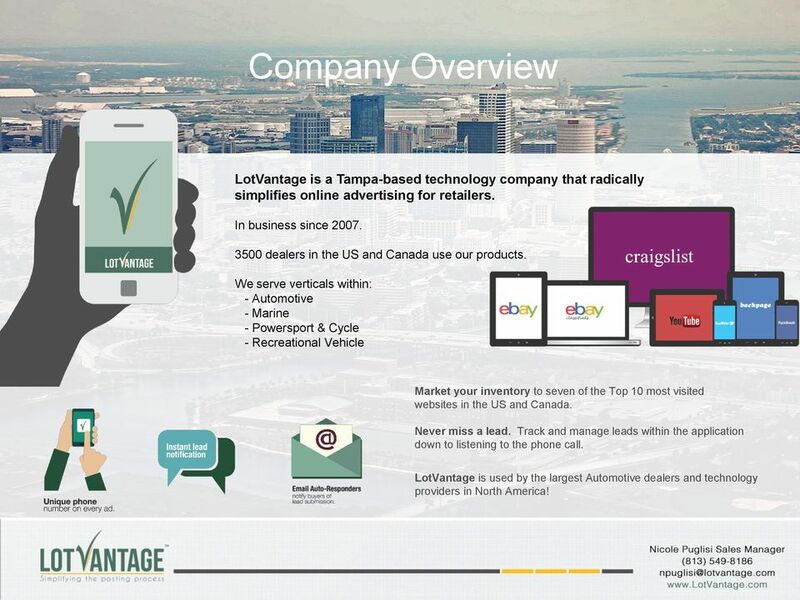 www.lotvantage.com Sales: (866) 881-3229. npuglisi@lotvantage.com Nicole (813) 549-8186"
2 Company Overview PAGE 2 LotVantage is a Tampa-based technology company that radically simplifies online advertising for retailers. In business since dealers in the US and Canada use our products. We serve verticals within: - Automotive - Marine - Powersport & Cycle - Recreational Vehicle Market your inventory to seven of the Top 10 most visited websites in the US and Canada. Never miss a lead. 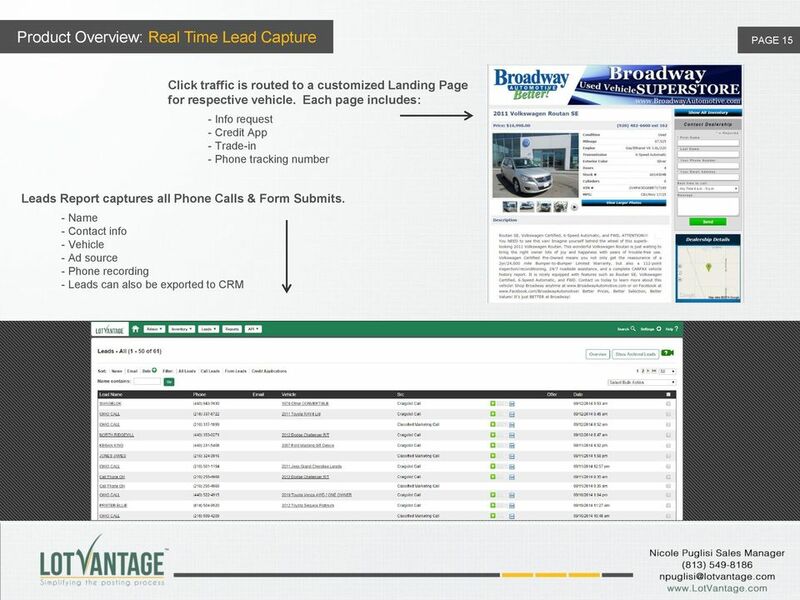 Track and manage leads within the application down to listening to the phone call. 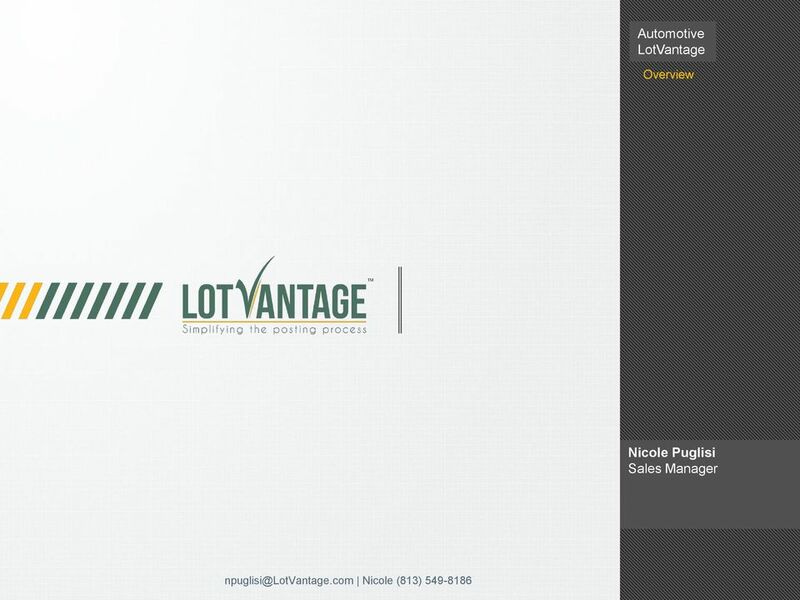 LotVantage is used by the largest Automotive dealers and technology providers in North America! 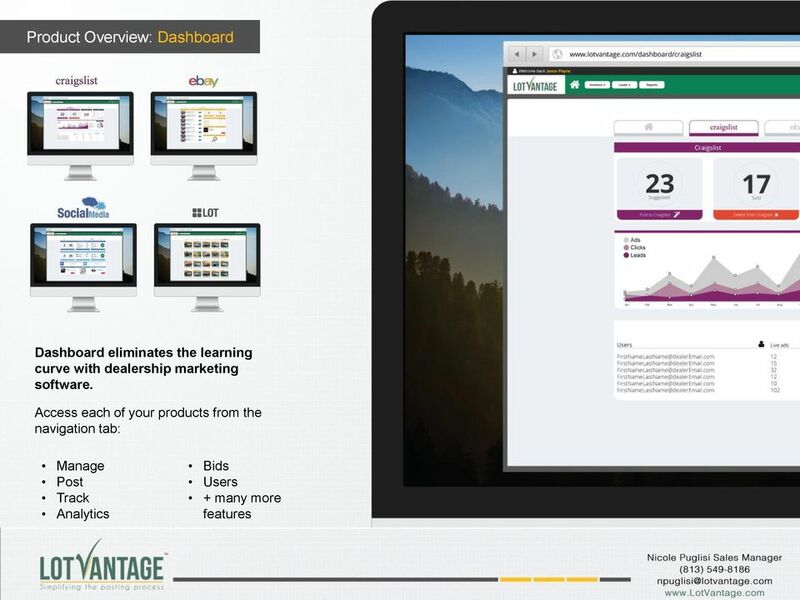 4 Product Overview: On The Lot PAGE 4 Inventory is exported to LotVantage via your DMS or Inventory Management System. 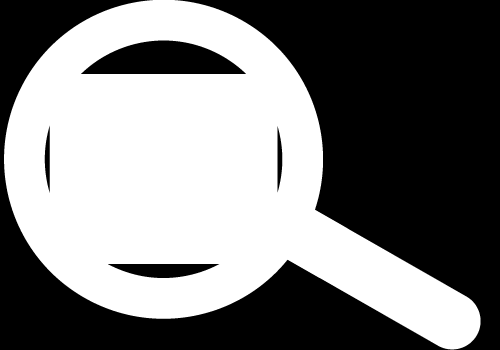 Intuitive point-and-click ad generation for each classified marketplace. 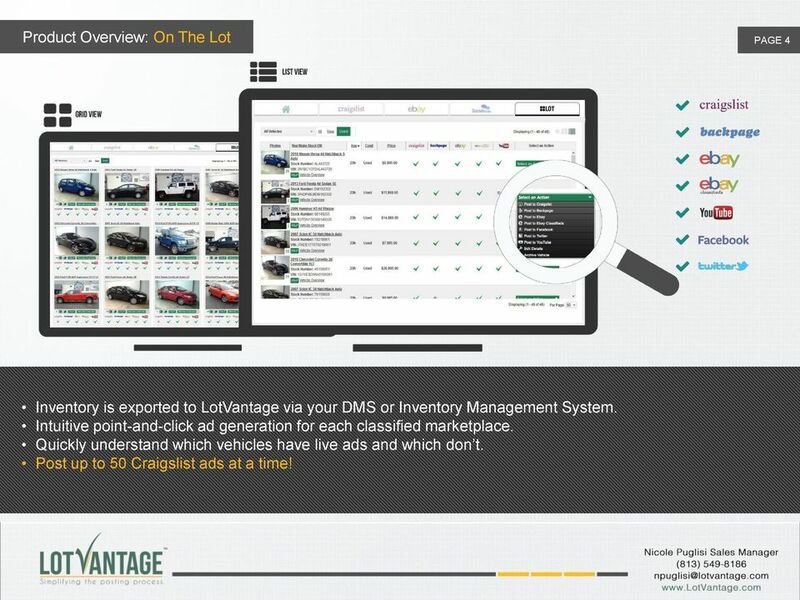 Quickly understand which vehicles have live ads and which don t. Post up to 50 Craigslist ads at a time! 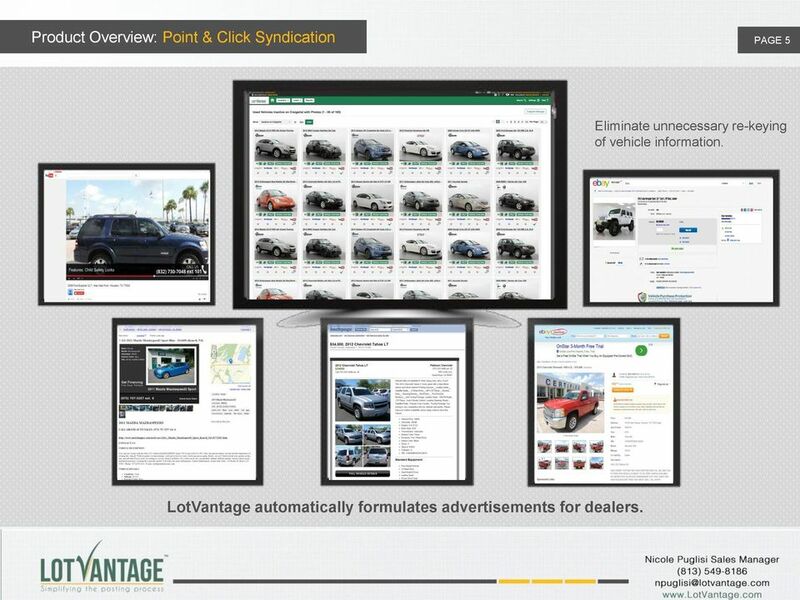 5 Product Overview: Point & Click Syndication PAGE 5 Eliminate unnecessary re-keying of vehicle information. 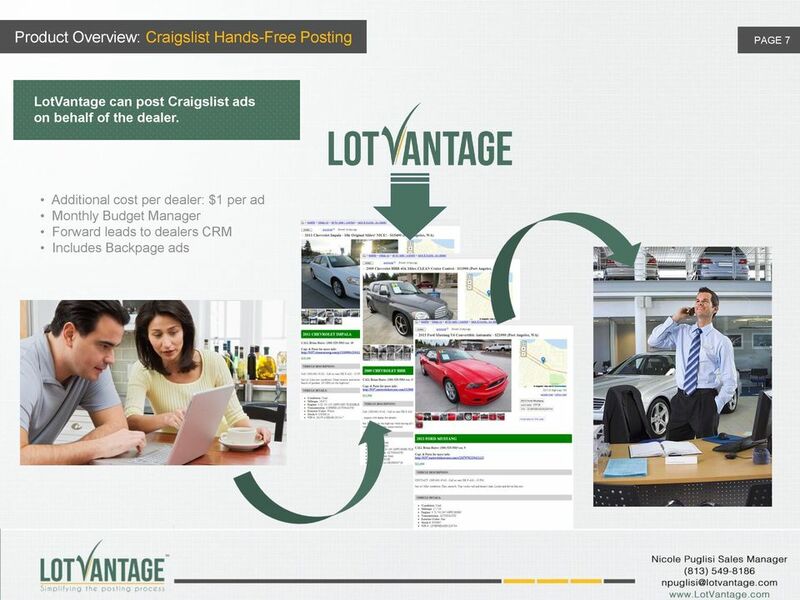 LotVantage automatically formulates advertisements for dealers. 6 How It Works: Craigslist Posting PAGE 6 LotVantage makes it simple to post an ad to Craigslist. We provide a single interface to post the inventory you want, using professional ad templates with integrated call tracking and payment methods. 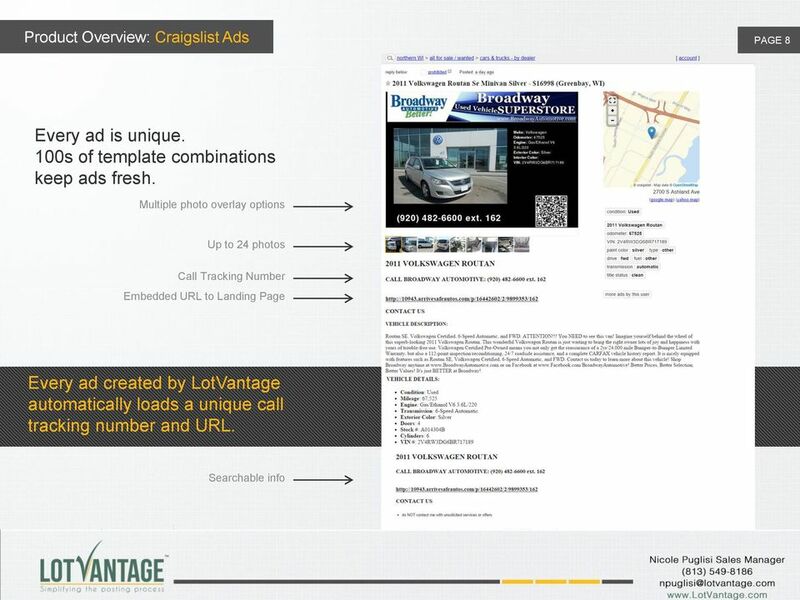 Easy as 1, 2, 3 Select the vehicle to Advertise then choose Craigslist from the Dropdown Review/Select up to 50 Vehicles to queue up Post Ads! 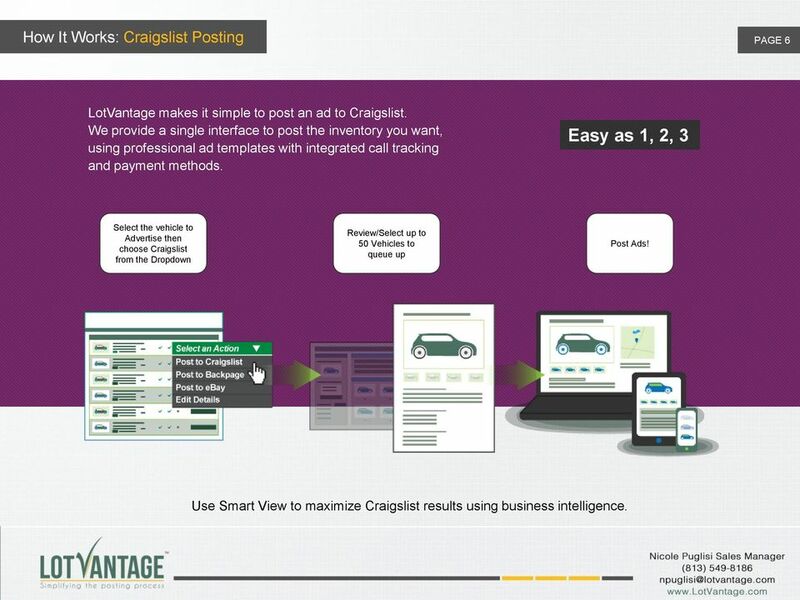 Use Smart View to maximize Craigslist results using business intelligence. 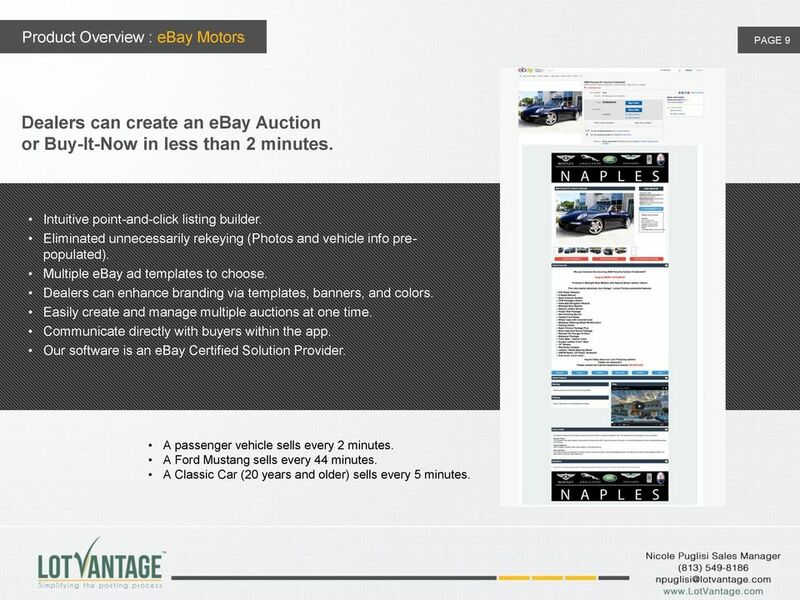 9 Product Overview : ebay Motors PAGE 9 Dealers can create an ebay Auction or Buy-It-Now in less than 2 minutes. Intuitive point-and-click listing builder. Eliminated unnecessarily rekeying (Photos and vehicle info prepopulated). Multiple ebay ad templates to choose. Dealers can enhance branding via templates, banners, and colors. Easily create and manage multiple auctions at one time. 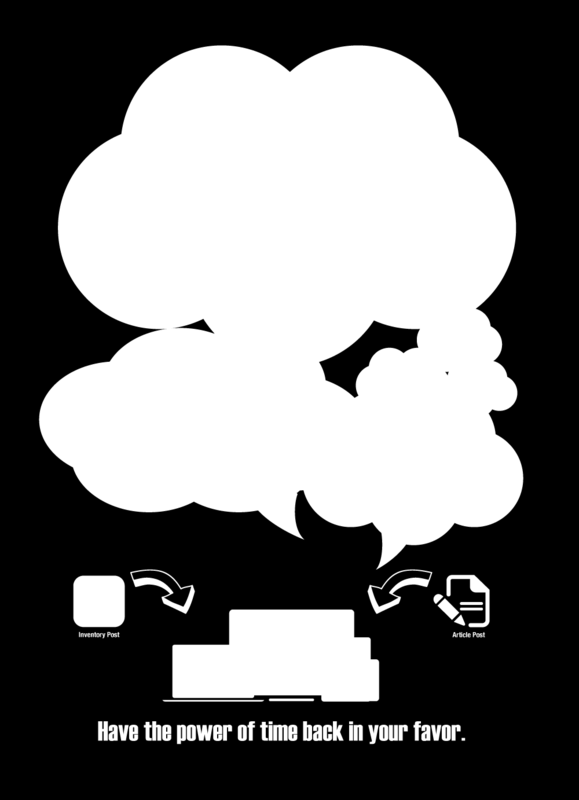 Communicate directly with buyers within the app. Our software is an ebay Certified Solution Provider. A passenger vehicle sells every 2 minutes. A Ford Mustang sells every 44 minutes. A Classic Car (20 years and older) sells every 5 minutes. 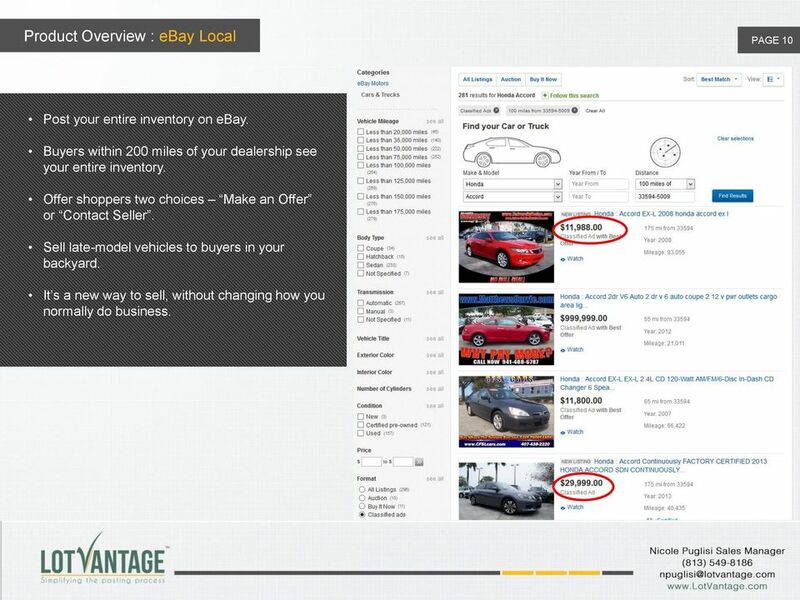 10 Product Overview : ebay Local PAGE 10 Post your entire inventory on ebay. 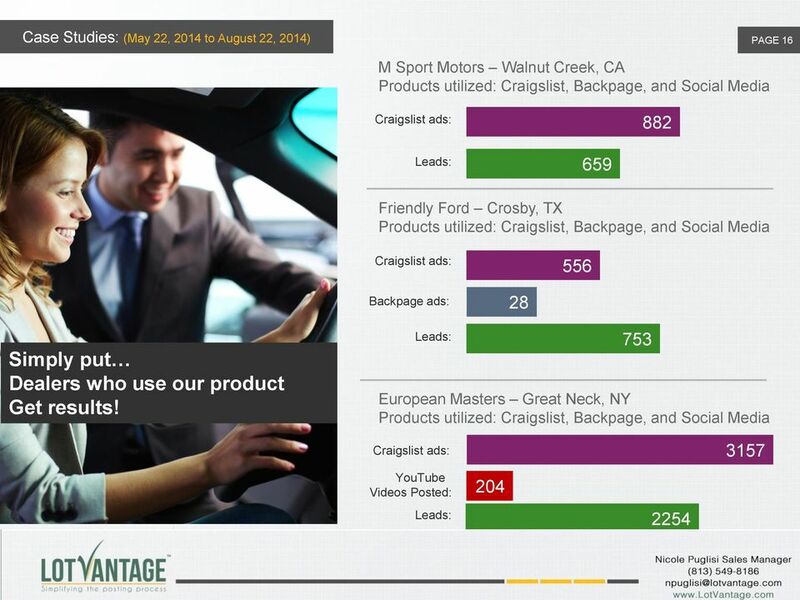 Buyers within 200 miles of your dealership see your entire inventory. Offer shoppers two choices Make an Offer or Contact Seller. Sell late-model vehicles to buyers in your backyard. It s a new way to sell, without changing how you normally do business. 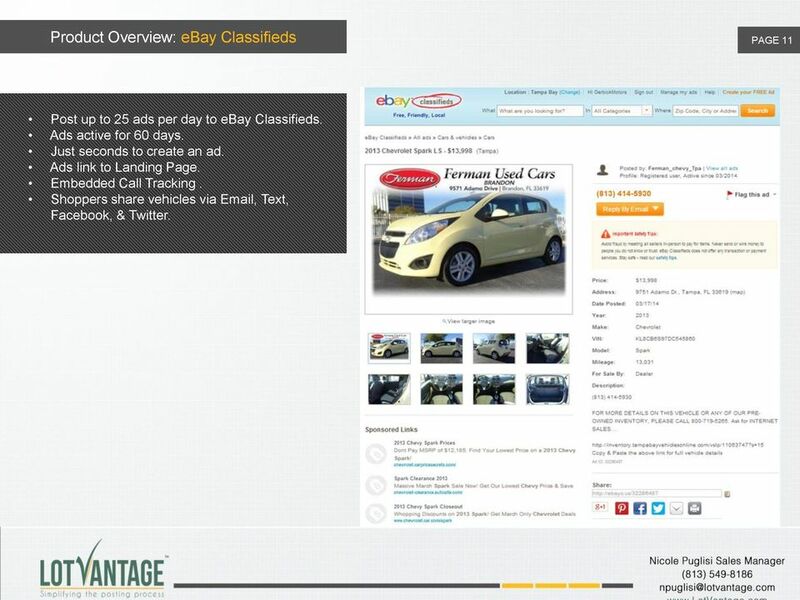 11 Product Overview: ebay Classifieds PAGE 11 Post up to 25 ads per day to ebay Classifieds. Ads active for 60 days. Just seconds to create an ad. Ads link to Landing Page. Embedded Call Tracking. Shoppers share vehicles via , Text, Facebook, & Twitter. 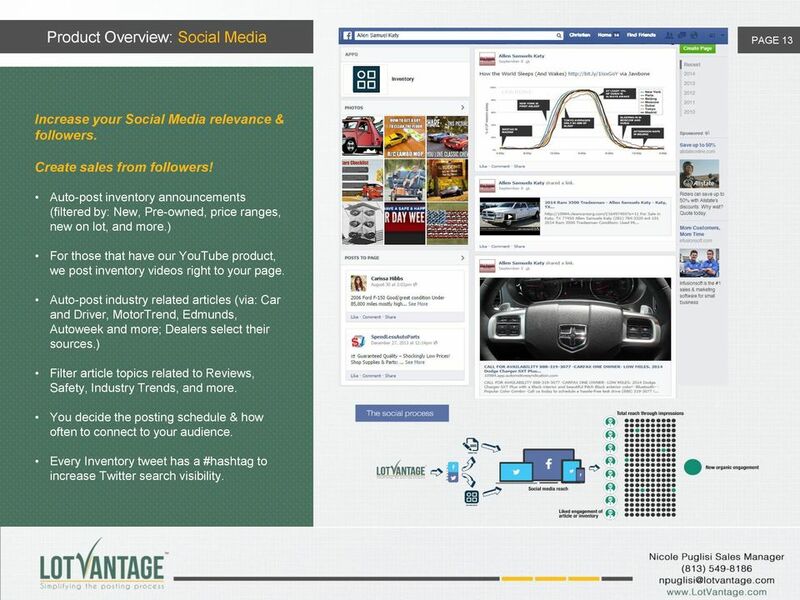 12 Product Overview: Social Media PAGE 12 LotVantage allows Auto dealers to put their Facebook and Twitter on autopilot. 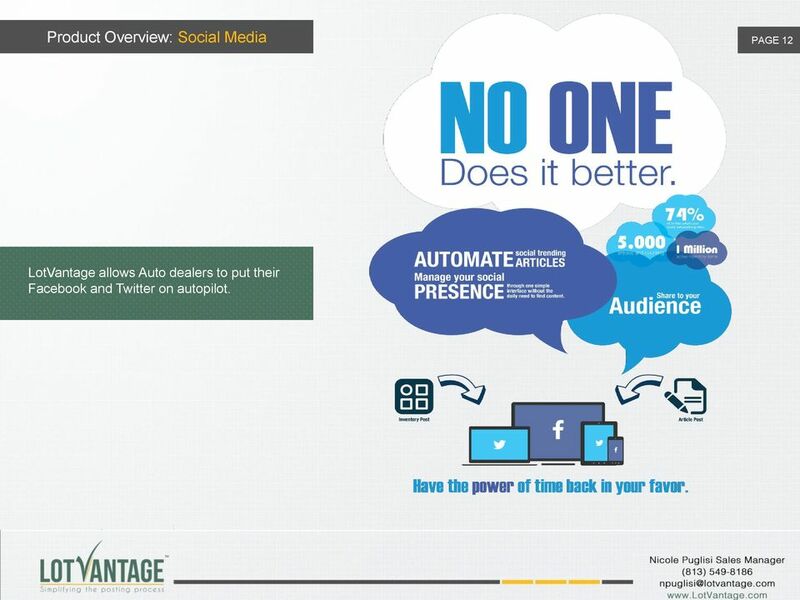 13 Product Overview: Social Media PAGE 13 Increase your Social Media relevance & followers. Create sales from followers! Auto-post inventory announcements (filtered by: New, Pre-owned, price ranges, new on lot, and more.) For those that have our YouTube product, we post inventory videos right to your page. 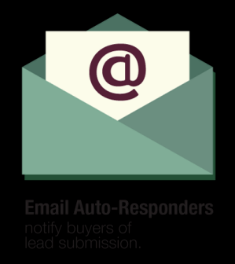 Auto-post industry related articles (via: Car and Driver, MotorTrend, Edmunds, Autoweek and more; Dealers select their sources.) 1 Filter article topics related to Reviews, Safety, Industry Trends, and more. You decide the posting schedule & how often to connect to your audience. Every Inventory tweet has a #hashtag to increase Twitter search visibility. 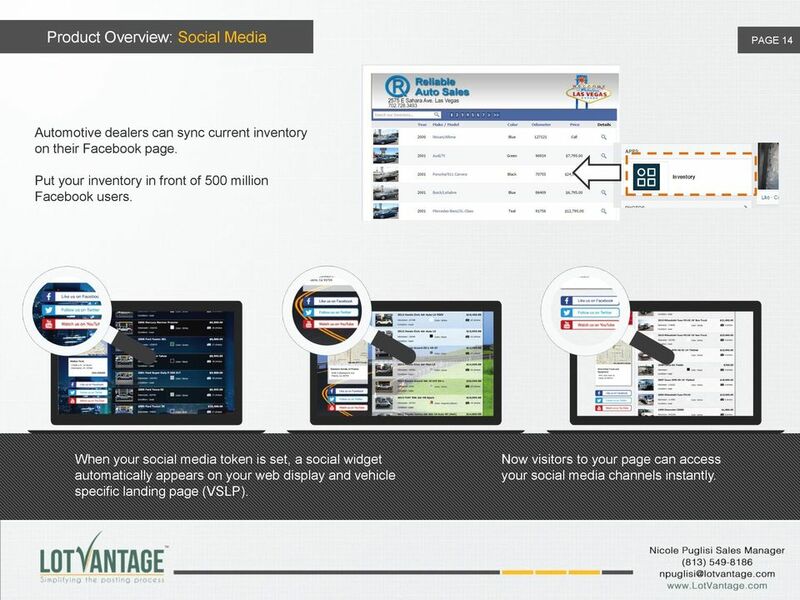 14 Product Overview: Social Media PAGE 14 Automotive dealers can sync current inventory on their Facebook page. Put your inventory in front of 500 million Facebook users. When your social media token is set, a social widget automatically appears on your web display and vehicle specific landing page (VSLP). Now visitors to your page can access your social media channels instantly. online classified sites. Souce: Google 2013 Automotive study. DealerCenter Online Ad Post User Guide Version 2.1 Online Ad Post The Online Ad Post product provides DealerCenter users with an improved, easy to use interface for managing their online advertising needs. Transforming Automotive Retail. : DEALERTRACK: the only connected SOLUTION driving the online to in-store convergence. Generate More Sales & Maximize Your ROI! ADVANCE DIGITAL MARKETING VIDEO TRAINING COURSE. Page 1 of 34 www.experttraining.in Youtube.com/ViralJadhav viral@experttraining. Your Next Customer Is Looking For Your Products & Services On Local Search Websites, Apps & Maps, RIGHT NOW! KBB.COM HAS LAUNCHED A NEW INVENTORY LISTINGS PROGRAM. DEALER SHOWCASE CUSTOMERS WILL RECEIVE EXCLUSIVE OPPORTUNITIES WITHIN THIS PROGRAM! KELLEY BLUE BOOK HAS EXCITING NEWS FOR OUR DEALER SHOWCASE CUSTOMERS KBB.COM HAS LAUNCHED A NEW INVENTORY LISTINGS PROGRAM. DEALER SHOWCASE CUSTOMERS WILL RECEIVE EXCLUSIVE OPPORTUNITIES WITHIN THIS PROGRAM! Welcome to second PGI AUTO TRAINING SEMINAR- Helping our dealers navigate the complex and ever changing Web space and help to generate the most leads became PGI s mission- therefore my personal passion. Сайт для обмена автомобилей по trade-in. Concept of Work. Examples of Other Similar Websites. Flow Chart. Necessary Elements. Functionality. The world s best education for dealership Internet strategies is just a click away. Enroll now! GET MORE SALES LEADS. DO NO EXTRA WORK. SELL MORE BIKES. One Agency One Message delivering results! Larry Barditch MSA Advertising VP, Digital Strategy & Innovation Larry@MSAadvertising. FEEL THE POWER OF OUR AUTOMOTIVE MARKETING EXPERTISE.